The Korean film industry has many great supporting players but perhaps none more so than the versatile Ryoo Seung-ryong. The dependable and chameleonic performer has been active for many years, however, 2012 was by far and away his biggest. He was excellent as the King’s right-hand man in Masquerade and he shined as the Cassanova-esque next door neighbor in All About My Wife. So popular was his performance as the middle-aged lothario that he has reprised the character for a number of local advertisements (like this one), which I must say I have enjoyed quite a lot. Following all the attention he’s been getting, it’s about time he got his own vehicle, and that’s just what’s happened, or almost. Ryoo takes center stage for the first time in his new film Miracle in Cell No.7. Yong-gu, a grown man with the mental capacity of a six-year old, is a loving father to Yesung who is falsely accused of killing a young girl. He finds himself in jail where more than anything he misses his daughter. As his cellmates gradually warm towards him, they concoct a scheme to bring his daughter into the prison under the nose of the watchful warden. To call the story unlikely would be an understatement, it’s flat out preposterous. Contrived to the nth degree, veracity is at every turn dismissed in favor of crafting situations designed to elicit the audiences’ laughter and tears. Though considering the film’s plot and intentions, would it have been reasonable to expect anything else? It’s to the filmmakers’ credit that things never get too out of hand in the sentimentality department. Emotional and cloying though much of the climax is, it seems comparatively tame when placed alongside other Korean melodramas and their violently tearful conclusions. The film’s narrative aligns a number of generic elements to create what is both a unique and very familiar premise. It’s a prison film, a family melodrama, an ensemble comedy, a courtroom thriller and a drama about a mentally handicapped protagonist. As we’ve become used to with Korean films, these are for the most part well-combined, even if believability is dispensed with. What’s even more interesting are the film’s allusions to a number of social themes. Chief among them is child abuse. Most unsettling is the re-enactment scene, when Yong-gu is forced to duplicate his supposed criminal act by coercive police offers in front of a frantic and upset crowd of locals. As rain beats down on him the throng on onlookers heaves to and fro and Korean classics such as Bong Joon-ho’s Memories or Murder (2003) and Lady Vengeance (2005) quickly come to mind. Also evident in the film’s thematic tapestry is the treatment of the handicapped in Korea and rampant cronyism in the nation’s judicial system. Surprisingly, the former is not addressed to any great extent even though I wouldn’t say it’s ignored. The latter, however, does become a significant part of the plot, particularly as it enters its final act. This theme is not used as effectively as it was in last year’s brilliant courtroom drama Unbowed but nonetheless adds more stress to the issue which was only recently in the news. Though given the commercial nature of the film, it is fair to question the intentions of including these very sensitive issues that have translated into significant financial success in recent years. The film’s greatest strength, and the primary reason for watching it if you can overcome the schmaltz, is its excellent ensemble cast. 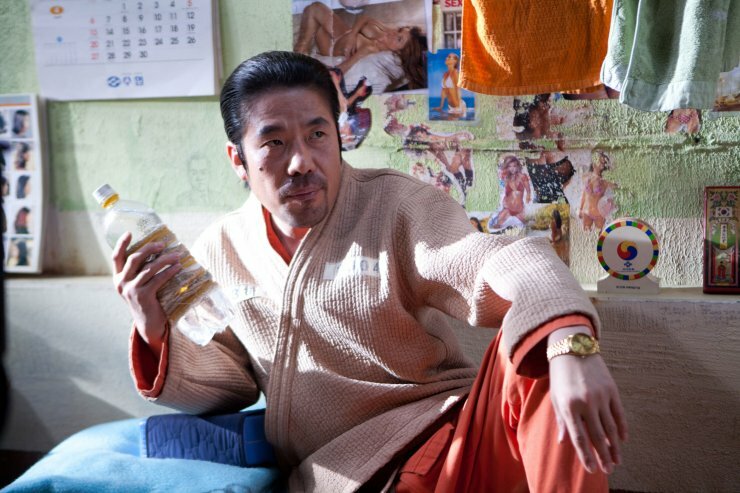 Yong-gu’s cellmates are all incarnated by some of the most recognizable and veteran actors in the business. Oh Dal-su, as the cell ‘boss,’ the oddball played by Kim Jong-tae and Park Won-sang, as the bookish right-hand man, all put in strong performances. Though hardly the best in their careers and often prone to caricature, they, along with the rest of the cast, make Miracle in Cell No.7 an engaging feature throughout. Meanwhile, Kal So-won, as the young daughter, is cute and adorable but a little too much so for my taste, perhaps my heart is made of stone. Ryoo has a tough job as playing a mentally handicapped character is always a tricky proposition. One can easily alienate viewers by being too histrionic. Thankfully, Ryoo mostly succeeds in avoiding this pitfall. That said I was glad that he was not the dominant lead of the film. For much of the running time he is not on screen, as time is devoted to the film’s many other characters. Even if it’s not a full starring role, Ryoo shows that he can ably lead a production and I imagine he will be making the transition to leading man over his next few projects. He may well become the next ajusshi (a Korean term for an older man) box office phenomenon, in the vein of Kim Yun-seok (The Chaser, 2008; The Thieves, 2012). Director Lee Hwang-kyung has specialized in saccharine family melodramas, including the woeful Champ (2011) but here he has refined his craft and exercised a modicum of restraint. A solid family feature that knows how to please its audience, Miracle in Cell No.7 worked a lot better than I thought it would. I would still be hesitant to recommend it to foreign audiences unless the cast appeals to you, in which case by all means give it a try.